Swarms of surgeonfishes are a common sight off the west coast of Kona. After years of rumblings, annual temblors with threats of legislation, and constant prophesies of doom for Hawaiian aquarium fishers—as well as mounting calls for a total ban on the marine aquarium trade—a landmark law has just been passed that will bring a sea change in the way a unique resource is used and managed in the volcanic islands of Hawaii. The law will affect the West Hawaii Regional Fishery, the state’s largest exporter of fishes for the aquarium trade, aka the “AQ Fishery,” which is based on Big Island. The new legislation is the result of many calls for the abolishment of all livestock collection by anti-aquarium activists, as well as urgent proposals from marine scientists to enact science-based rules. While some fish collectors have resisted all change, many others have supported the implementation of workable rules and regulations to protect the fisheries and their own livelihoods. Some observers expect the legislation to spread, in one form or another, to other jurisdictions in the Aloha State. 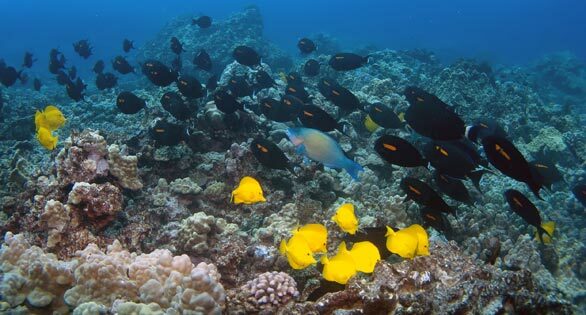 Kona, Hawaii’s “Big Island,” is home to the largest exporters of marine aquarium livestock but also to many conservation areas and popular dive sites. “AQ” collection area on the west coast shown shaded in yellow. The long battle ended in December, when Hawaii Governor Neil Abercrombie signed a new rules package into law. The regulations, drafted by the Department of Land and Natural Resources (DLNR), Division of Aquatic Resources (DAR), were based on collaborative work with fishers, fishery managers, scientists, and other community members who were both for and against the marine aquarium trade. 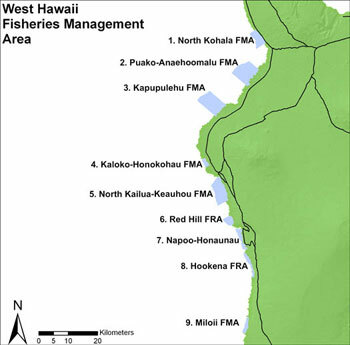 The WHRFMA was established in 1998 as the result of legislation enacted to address an increasingly controversial aquarium fishery in the waters off Big Island. 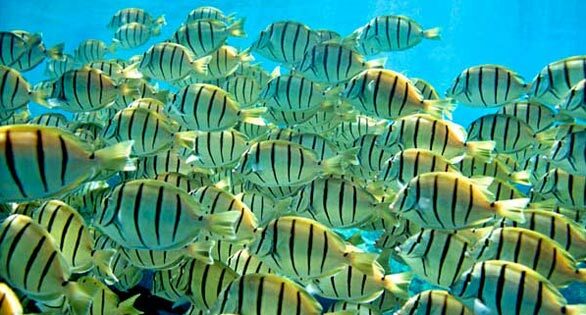 Known as Act 306, it stipulated that at least 30 percent of the west coast of Big Island be set aside for fishery replenishment areas (FRAs), where no aquarium fishing would occur. Act 306 also led to the creation of the WHFC, the multistakeholder group responsible for advising DAR on the drafting of the new rules package. New rules will continue to allow spear fishing, but the use of scuba breathing gear is now forbidden. Image: B. Inaglory/Wiki Commons. The rules will affect a variety of ocean resource uses in the WHRFMA, extending far beyond aquarium fishing. Conflict between fishers, divers, and other resource users has been particularly high here. The overall goal of the new rules is to more effectively regulate and protect marine resources in the roughly 150-mile stretch along the coast from Upolo Point in the north to South Point. Currently, more than 35 percent of Big Island’s Kona coastline is set aside as FRAs, and the new rules will add additional regulations governing those same waters. They will have no effect anywhere else in the state. Toward the end of the lengthy drafting process, a proposed rule prohibiting spearfishing with SCUBA gear arguably became the most controversial talking point. 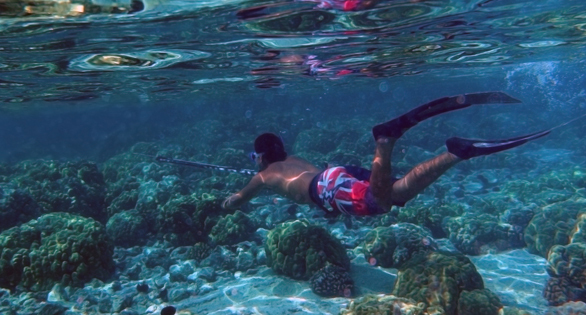 Many local Hawaiians argue that SCUBA spearfishing is about feeding their families, but those supporting the prohibition say that spearfishing with SCUBA gear is nothing short of slaughter. This is especially true, they say, when vulnerable species that sleep in the open are targeted at night. 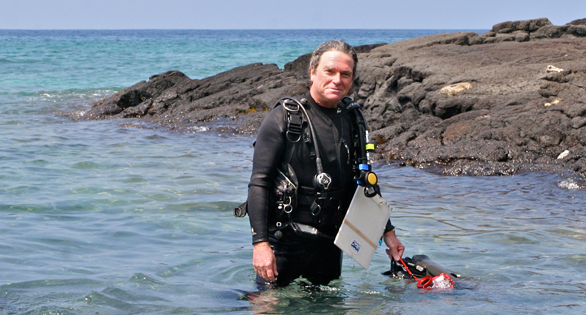 Proponents of a ban on SCUBA spearfishing point out that it is already banned in most other regions in the Pacific and elsewhere because of the potential for over-exploitation. In addition to explicitly addressing the aquarium fishery and the ban on SCUBA spearfishing, the rules package prohibits the take or possession of nine species of inshore sharks and rays and two invertebrates. Supporters of the rules package believe that although they have no direct impact on the aquarium fishery, the prohibitions on the take of sharks and rays—like the prohibition on SCUBA spearfishing—are important for the protection of marine life. The BLNR approved the rules package in late June 2013, but momentum seemed to stall out in the governor’s office. Some supporters were afraid the governor would not sign it into law at all. At the signing event, Abercrombie said he took his time, as he does with any controversial legislation, so “everyone would feel they had their views respected.” He pointed out that more than 500 community members have taken part in crafting the rules package over the past 10 years, and the BLNR considered more than 1,200 pieces of testimony and 2,300 comments before signing off on the rules. 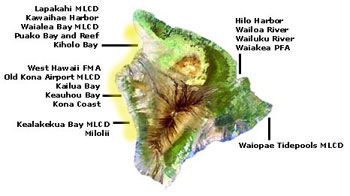 West Hawaii Fisheries Management Area on the West Coast of Kona on the Big Island of Hawaii. While limiting the number of fishers is not part of this rules package, new limits will go into effect. For example, there will now be both bag and slot limits for the Achilles Tang (Acanthurus achilles), the Kole Tang (Ctenochaetus strigosus), and the Yellow Tang (Zebrasoma flavescens)—three iconic species commonly targeted in the aquarium fishery. Aquarium fishers will be permitted to take only the 40 fish species that appear on a new White List within the WHRFMA (see References below). The rules package is, by almost anyone’s account, not perfect, but proponents of the rules believe it is an important step in the right direction. While many aquarium fishers continue to feel they have been unfairly singled out and forced to make too many concessions, many on the extreme anti-trade side of the debate feel that anything short of closing the fishery does not go far enough. Nonetheless, supporters of the new rules, including the governor, point to the potential for a better-managed fishery based on data. Lieutenant Governor Shan S. Tsutsui is said to have indicated to supporters of the rules package who met with him prior to the governor’s arrival that the Abercrombie administration is ready to expand the WHFC model to the rest of the state. Aquarium fishers who operate outside of the WHRFMA, such as those who fish off Oahu, express concern that the West Hawaii rules package will set a precedent for managing the rest of the state, and that a management approach appropriate for Big Island’s fishery would not work on Oahu. Anyone with intimate knowledge of aquarium fishing in Hawaii knows the two islands have very different types of fisheries. While the Big Island fishery tends to deal in large volumes of a few species, Oahu’s fishery deals in smaller numbers of multiple species. Convict Tangs are not on the White List for aquarium collection, but are a target for spearfishers. Meanwhile, some fishers and aquarists continue to communicate trepidation about the White List. Expressing concern that the list includes only the species most commonly collected today, advanced aquarists wonder about the future of the hobby and whether developments in aquarium technology may make keeping some species currently considered difficult to keep far easier. Others worry that with advances in aquaculture, private breeders will have a more difficult time acquiring broodstock of new endemic species. While there is clearly a provision for removing species from the White List if the data show it is necessary, some point out that there is no similar provision for adding a species to the White List. Fisheries managers say the White List is based on a number of criteria, but one of the most important is the fact that these are the species on which they have the data. Of course they have the data in large part because these are the species most common in the trade today, but the fact of the matter is that data-based fisheries management requires data on the target species, so they feel limiting the take to these 40 species makes the most sense at present. In addition, fisheries managers point out that all of the species that will now be off limits for collection within the WHRFMA are still legal to harvest outside of the management area. For many individuals who see real value in sustainable aquarium fisheries, the Holy Grail has been a transparent aquarium fishery managed with good data that shows sustainability beyond a shadow of a doubt. With the signing of the West Hawaii rules package, that ideal may have just become a lot more plausible. I m retailer shop pakistan city karachi. I need hawaiian fishes .